I have a degree in Anthropology but you don't need one to see the differences in the photo posted above. The shape of our teeth and and the way our jaw moves are just a few reasons why I think we are not physically designed to eat meat. 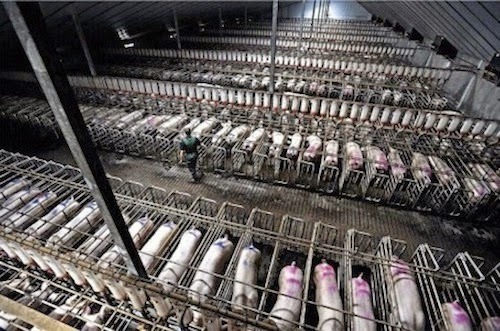 That doesn't mean we can't and Americans certainly do eat a lot of animals. Over 10 billion land animals are factory farmed and slaughtered a year in the United States alone but that is another post. Have you looked at the average waistline in our society? Children are eating the same foods their parents eat which is a lot of processed and fast food loaded with saturated fat. A prior town I lived in Jacksonville, FL was once ranked #8 in Men's Health as one of the fattest cities in the US and I'm not surprised! "Eighty percent of schools still serve too much greasy, fattening food to meet the government's own nutrition guidelines," says PCRM president Neal Barnard, M.D. If you don't care about saturated fat in your diet you should be concerned about your health care premiums. Back to my anatomy lesson. Just because I can eat a double whopper with cheese, large order of french fries and a milk shake doesn't mean my body is designed to digest it efficiently. My belly aches thinking about it. I'm going to summarize below an article from Milton R. Mills, M.D. 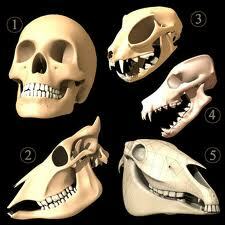 and include some facts about the anatomical and physical differences between herbivores and true carnivores. I encourage you to read his full article, go take a good look at your cat and discard your Paleo book. The human gastrointestinal tract features the anatomical modifications consistent with an herbivorous diet. Humans have muscular lips and a small opening into the oral cavity. Many of the so-called “muscles of expression” are actually the muscles used in chewing. The muscular and agile tongue essential for eating, has adapted to use in speech and other things. The mandibular joint is flattened by a cartilaginous plate and is located well above the plane of the teeth. The temporalis muscle is reduced. The characteristic “square jaw” of adult males reflects the expanded angular process of the mandible and the enlarged masseter/pterygoid muscle group. The human mandible can move forward to engage the incisors, and side-to-side to crush and grind. In conclusion, we see that human beings have the gastrointestinal tract structure of a “committed” herbivore. Humankind does not show the mixed structural features one expects and finds in anatomical omnivores such as bears and raccoons. 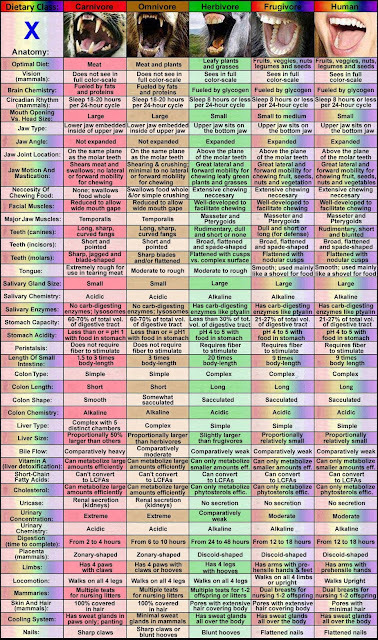 Thus, from comparing the gastrointestinal tract of humans to that of carnivores, herbivores and omnivores we must conclude that humankind's GI tract is designed for a purely plant-food diet. One of the best things you can do for your health is go vegan. Feel free to read my other posts and join me on my journey.